Monarch butterfly decline: Monsanto’s Roundup is killing milkweed. 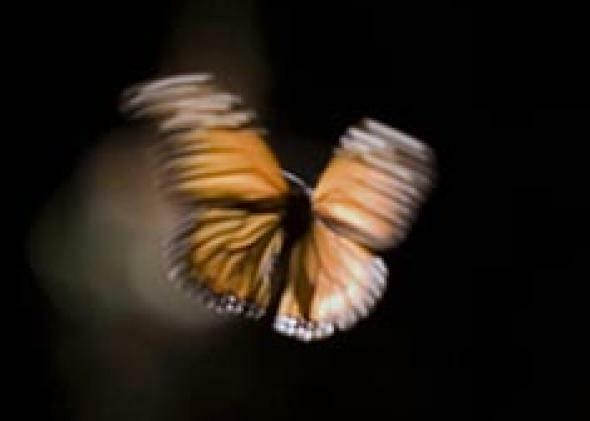 Monsanto’s Roundup and genetically modified crops are harming everybody’s favorite butterfly. Monarch butterflies in 2008 at the Sierra del Chincua sancturay in Angangueo, Mexico. The number of monarchs reaching Mexico has now reached the lowest level on record. Feeding on a weed seems like a good evolutionary bet. And for a long time, it worked well for the monarch butterfly. The butterfly’s life cycle is exquisitely synchronized to the seasonal growth of milkweed, the only plant its larvae will eat. In a game of hopscotch, successive generations of monarchs follow the springtime emergence of milkweed from Mexico as far north as Canada. The hardy plant once flourished in grasslands, roadsides, abandoned lots, and cornfields across much of the continent. It fueled a mass migration that ended each winter with more than 60 million butterflies converging on pine forests in the Sierra Madres. The number of monarchs reaching Mexico has been falling for years, and it has now reached the lowest level on record. The World Wildlife Fund announced Wednesday that butterflies this winter were found in 1.7 acres across 11 sanctuaries, down from a high of 45 acres in 1996. If you want to know a main reason why, look no further than your corn chips and ethanol-spiked gasoline. The monarch population sank while agriculture boomed. More than a million acres of Upper Midwest grassland have been plowed under in recent years for corn and soybean fields—a rate of loss comparable to deforestation in places like Brazil and Indonesia. Demand for these crops has surged with the rise of biofuels. At the same time, technology enabled farmers to squeeze ever more from each acre. For monarchs, the most important development was Roundup Ready corn and soybeans. Since the turn of the century, these genetically modified crops have risen to dominance in the Midwest. Designed to withstand dousing from the Monsanto company’s Roundup weed killer, the plants enabled farmers to swiftly kill competing weeds, including milkweed, while leaving their crops untouched. In 2013, 83 percent of all corn and 93 percent of soybeans in the United States were herbicide tolerant, totaling nearly 155 million acres, much of it in the Midwest. It’s no coincidence monarchs faltered at the same time. Karen Oberhauser, a conservation biologist at the University of Minnesota, and a colleague estimated that as Monsanto’s Roundup Ready corn and soybeans spread across the Midwest, the amount of milkweed in farm fields fell by more than 80 percent. Oberhauser determined that the loss of milkweed almost exactly mirrored the decline in monarch egg production. Soon there will be essentially no monarchs on cropland in the corn belt, according to some estimates. Already, Iowa farmland has lost more than 98 percent of the milkweed that was once there, according to Iowa State University biologist John Pleasants, who worked with Oberhauser. He’s seen firsthand the transformation as he has studied cornfields during the past decade and a half. Before Roundup, patches of milkweed grew among the corn and along the edges of fields. After the herbicide—nothing but corn. No one expects that agribusiness will give up efficient, lucrative, and potent tools. Instead, butterfly advocates are hoping the industry will throw some money and marketing savvy behind campaigns to get people to plant more milkweed elsewhere. Taylor last year started marketing tiny milkweed seedlings to gardeners. He sold 20,000 and is gearing up to double or triple that this year. But he acknowledges it’s a fraction of what’s needed. This doesn’t mean the monarch is about to go the way of the passenger pigeon. * The butterfly, which is also found in Hawaii, Australia, New Zealand, Spain, and Portugal, still numbers in the millions. It’s not a candidate for the Endangered Species Act. But there’s concern that the epic mass migration to Mexico, a natural wonder, could disappear. The success of this transcontinental trip could depend on a critical mass of butterflies, said Oberhauser. The massive gathering might help protect against predators, much as tiny fish seek safety in huge schools, she said. But if there aren’t enough butterflies, the tactic might not work. Huge clusters of butterflies could also help them stay warm and save energy as they wait for spring to arrive. Oberhauser’s immediate concern is at once more practical and more romantic. She worries that as monarchs get harder to find, people will lose a popular link to the natural world—a gateway drug for nature lovers. How many kids in classrooms around the country have watched a plump caterpillar become a jade-green capsule the size of a peanut shell, then a monarch butterfly? As a child I saw the drama unfold in an aquarium in my family’s living room in Idaho. It was magical to see the subject of all those children’s books and metaphors of transformation given flesh. Flash forward 30 years, and I resolved to repeat this monarch ritual with my children. I led them into a patch of milkweed plants in a Vermont field, confident that we would quickly wrangle a half-dozen caterpillars. Several hours later, we had one hostage. Even with the dismal winter numbers, there’s still hope for summer caterpillar hunters. Monarch numbers will probably stay lower than they were in a weedier world, but the butterflies lay enough eggs that they can bounce back a bit in just one season, Taylor said. Now he’s watching the spring weather forecast in Texas and crossing his fingers.